This entry was posted in Uncategorized and tagged chicken, cooking, food, Roast, Root Vegetables, Vegetables by christao408. Bookmark the permalink. And a dinner I will make tomorrow. I am off and have my usual housework to do so this will make a great dinner. Thanks. You really do make this look so easy (and I know it’s not!). Beautiful pictures… and you’ve made me hungry! Truthfully, when my fridge and pantry get low, I get agitated. It’s a bit easier now that my with my current job, but I HATE empty shelves. @Passionflwr86 – No, no – it really is easy. 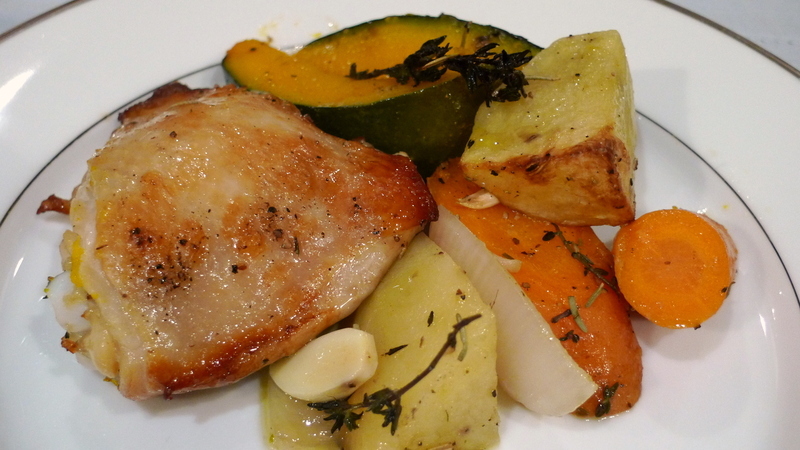 Roast chicken with root veggies is simple. It isn’t necessary super-fast as it does take 45-60 minutes to roast, but the effort required is minimal and the skills needed are basic. Please try! @Fatcat723 – Let me know how it goes. @amygwen – It is funny, I get a little nervous if my fridge is too full, too, because I’m sure there is food that isn’t getting eaten and I hate throwing away food. @Sinful_Sundae – I’ll go take a look at it, thanks. I hope I have mood to make it. It’s my type of food. mm… i haven’t roasted a chicken in a while. 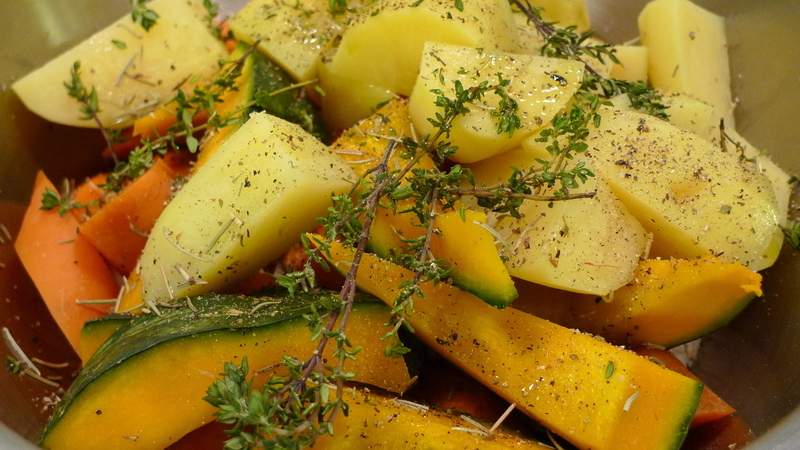 i never thought of adding kabocha squash into a mix of roasted vegetables… i’ll have to try that. i’ve only roasted it by itself, with some spices and sugar. 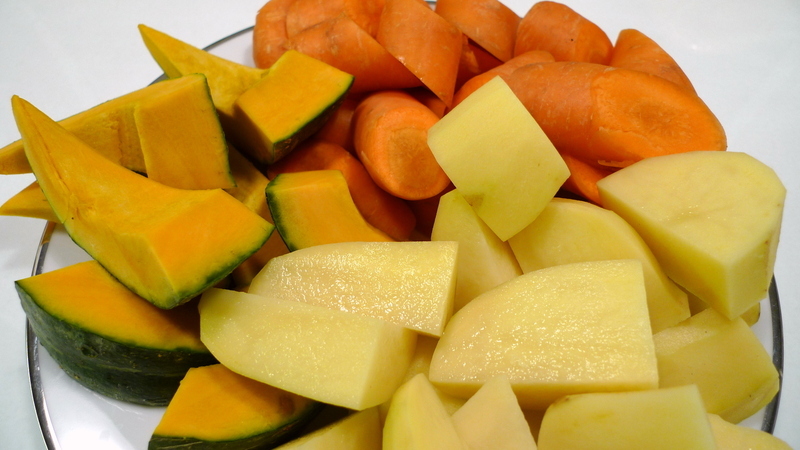 @kunhuo42 – The kabocha squash is what is sold locally here in Thailand as “pumpkin” and other than butternut squash is usually our only squash option. Interestingly, I think of it as a savory food, given how it is cooked most often in Thai dishes. @foggysunnymorning – @yang1815 – Glad to hear it! @Wangium – Really? I would have thought really Midwestern. @christao408 – oh, i mostly think of kabocha as a savory food also, since that’s usually the way i eat it. my parents usually stir fry it with pork and black bean sauce. I got a small kabocha, 2 potatoes, and some chicken wings today, but forgot carrots. Oh well, I guess I can make roaste chicken wings one day.